Clinique For Men is where dermatological know-how meets common sense. 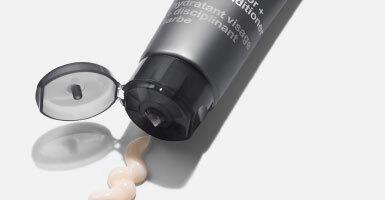 Specialized formulas and simple, smart routines give men’s skin what it needs to be great skin. For basic, daily care, Clinique’s dermatologist-developed 3-Step routine is fast and effective. Just cleanse, exfoliate moisturize—and you’re done. Choose from a range of cleansers customized for your skin type and concerns, including Face Wash, Oil-Control Face Wash and Charcoal Face Wash.
Clinique’s Exfoliating Tonic comes in two strengths so you can customize the level of exfoliation skin needs. Exfoliation is important for two reasons: it helps skin absorb moisture and treatment products better, and it preps skin for shaving. You’ll get a much closer, more comfortable shave if you exfoliate first. Take your pick of high-performance moisturizers, including Anti-Age Moisturizer and Oil Control Mattifying Moisturizer. Seeing lines, wrinkles or dark spots? 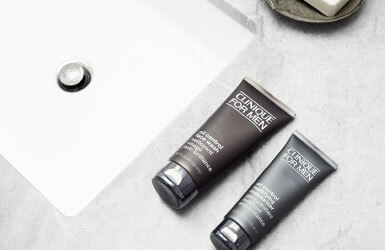 Clinique For Men has targeted de-aging formulas and a potent serum for dark spots that gets visible results. To keep skin looking younger, hydrate daily for a revitalized look. 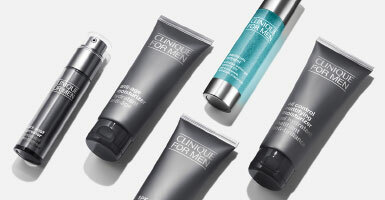 Clinique For Men has an Anti-Aging moisturizer with skin-strengthening and firming ingredients to combat lines, wrinkles and dullness. Take care of your skin today with Clinique For Men and you’ll like the way it looks tomorrow.